Want to learn how to make almond milk at home? It’s easier than you might think! The milk is creamy, flavorful and tastes much less processed than the store brands I’ve tried. This is because homemade almond milk has no additives or stabilizers. The only ingredients are almonds and water. Amazing! Learn how to make almond milk with this easy, step-by-step tutorial, and never buy it from the store again. I’ve been trying to cut back on milk. I drink quite a bit of coffee and tea, and cereal is one of my guilty pleasures. I feel like the cumulative effect on my body isn’t a heathy one. To offset this, I’ve recently been alternating between milk and non-dairy alternatives. One of my favorites is soy milk, because it has the added protein (and there’s something about the flavor I like). A few years ago I experimented with making homemade soy milk. I still like making that, but I’m more into making homemade nut milks. Why, you may ask? While I don’t mind the taste of store-bought soy milks, I’ve never been wowed by any of the packaged nut milks. In my opinion, they have a weird mouthfeel and aftertaste. Homemade almond milk is much better. It’s a fact. It’s not enough for my coffee, but I love it in tea, cereal and smoothies as well. Wondering what’s in almond milk? This almond milk recipe couldn’t be simpler! All you need to make almond milk from scratch are almonds and filtered water. Make sure you’re using unsalted raw almonds for this recipe, as pre-packaged salted almonds won’t give you the right flavor. Preparing homemade almond milk is easy! You start by soaking the almonds in filtered water for a minimum of 8 hours (I usually let them soak overnight). Next, you’ll want to drain the almonds through a colander and give them a rinse. The almonds will still be firm, but softer and more mealy to the touch. Place the almonds in a blender along with fresh filtered water. Turn the blender on low speed to begin chopping them, and then slowly turn the speed up to high and puree for 1-2 minutes, until you have a white, frothy mixture. Strain the liquid through a fine mesh strainer lined with cheese cloth (or use a nut milk bag, more below). Voila! You’ve made almond milk! 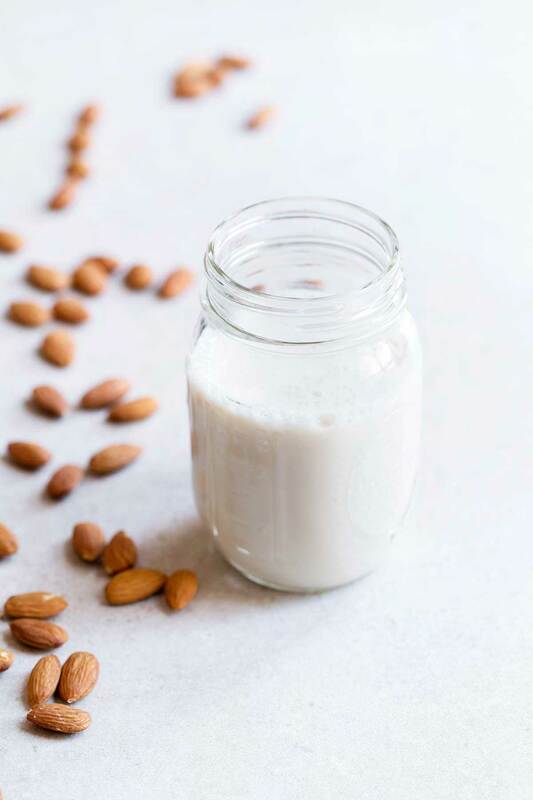 If you want to make a flavored almond milk that tastes more like what you get at the store, add a few splashes of pure vanilla extract and a drizzle of agave to this unsweetened almond milk. Play around with the almond milk to sweetener ratio to find out what level of sweetness you enjoy most. You’ll want to enjoy this almond milk within two to three days of making it. And since homemade almond milk doesn’t include any stabilizers, natural separation will occur. I store leftovers in the refrigerator using a jar with a tight fitting lid. Before serving, I give the jar a good shake. 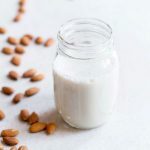 This almond milk recipe makes 2 to 3 cups of unsweetened almond milk, so you should have no trouble finishing it off within a couple days! Some of my favorite ways to use almond milk are poured over my morning bowl of muesli, in chai lattes, blended into chocolate smoothies, poured over a warm bowl of oats, or enjoyed plain. I recommend purchasing almonds in bulk to save money. You can either purchase them from the bulk section of your local grocery store or online. Since I’m now making nuts milks from scratch on a regular basis, I purchased a Nut Milk Bag to avoid wasting cheesecloth. It’s definitely worth it! It’s inexpensive and very easy to clean. Also, no pulp slips through, which was sometimes an issue with the cheesecloth. It’s very important to soak the almonds for at least 8 hours, but they’ll stay in the refrigerator in an airtight container for up to 5 days. Make sure to leave plenty of space and add extra water on top, since the almonds will expand. Most blenders will get the job done, but there’s nothing quite like the industrial blenders. I have a Vitamix blender, and I use it constantly. I realize that’s a bit excessive for most people. This recipe will work with most nuts (try cashews or macadamias). This strawberry macadamia nut milk is one of my favorite variations. 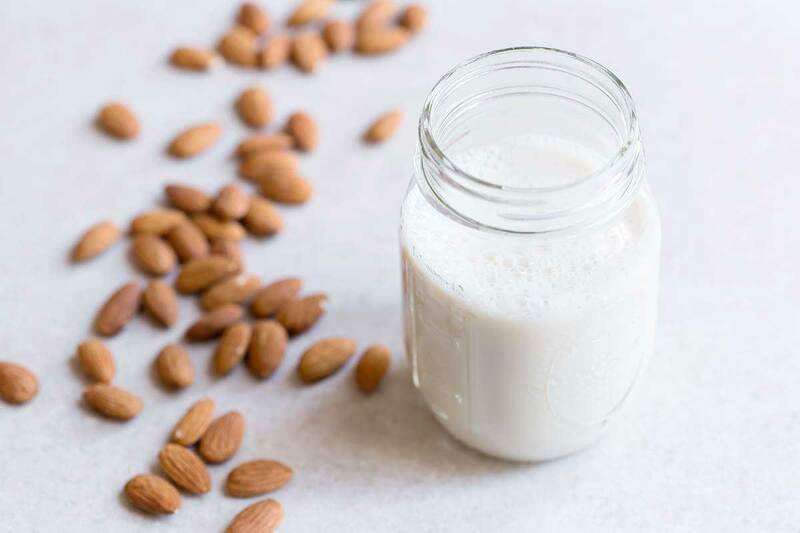 If you’re seeking a dairy-free milk alternative, almond milk is a great choice for several reasons. It has less calories and carbohydrates than cow’s milk, and is easy to digest for those who are lactose intolerant or otherwise sensitive to dairy. While it’s not a good source of protein and calcium compared with dairy milk, there are plenty of ways to get more protein and calcium into your diet. Looking For More Almond Recipes? Check out my homemade almond butter, Warm Zucchini Salad, Cherry Almond Coconut Quinoa Porridge, and Roasted Green Beans with Parmesan and Almonds. Want to learn how to make almond milk at home? It's easy! The milk is creamy, flavorful and tastes much better than store-bought brands. Place almonds in a medium-sized bowl and completely cover with filtered water. Make sure to add plenty of water, since the almonds will absorb and expand. Place in the fridge to soak for at least 8 hours, preferably overnight. This can be done up to 5 days ahead of time. Rinse the almonds in more filtered water and then place in a sturdy blender. Add 2 1/2 -3 cups of filtered water. For creamier milk, add less water. Start on low speed to chop the nuts, then slowly turn the blender speed up to high and puree the almonds for 1-2 minutes, until the mixture is white and frothy. Place a fine mesh strainer and cheesecloth over a bowl. Alternately, you can use a nut milk bag (see link in post). Allow the almond mixture to strain. Give the bag a gentle squeeze to coax out the remaining liquid. Discard the leftover pulp or, even better, look online at the assortment of recipes using almond meal. If you want to flavor the milk so it tastes more like flavored store brands, try adding a splash of vanilla and agave nectar. Consume within 2-3 days. Separation is natural in homemade nut milk; simply shake or whisk before serving if separation occurs. Unlike this all-natural milk, store brands contain stabilizers and preservatives. This recipe makes 2 to 3 cups of almond milk. I’ve made rice milk before but never almond milk. It looks like much the same process. Now I’m inspired to try it! for a little over a year now for a vegan family. Coming from my family where veganism wasn’t even really discussed as a viable option (cause you need your protein from meat and cheese, as they say), learning different food recipes has been an adventure and learning curve. Consistently now, I make about 2 gallons of almond milk a week (white and chocolate), and lots of different goodies and meals at work. I love this, thank you in advance for saving me money and making one more thing preservative free in my life. Too sweet!! This is so great! I just came home with some almond milk from the store, but I’m disappointed with it because it seems to have a lot more ingredients than necessary… and this sound pretty inexpensive. Thank you so much for visiting my blog and commenting! You look like you have a really awesome thing going on here, I’m going to have to come back again!! Forks over Knives – I have to see that, I love documentaries like this. I see you’re planning to make coconut milk? It’s basically the same recipe – and it makes a great extremely refreshing sorbet, because it has a lot more freshness in comparison to store bought coconut milks. I loved the moving Fork over Knives!!! So moving… love this post.